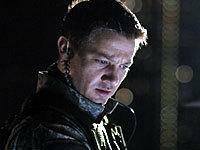 Overview - The film picks up six months after the Rage virus has spread throughout the city of London. The United States Army has restored order and is repopulating the quarantined city, when a carrier of the Rage virus enters London and unknowingly re-ignites the spread of the deadly infection, wreaking havoc on the entire population. The virus is not yet dead, and this time it's more dangerous than ever!! Released in 2003, '28 Days Later' was a breath of fresh air for the zombie genre. Danny Boyle's tense and kinetic action-horror fest was one of the few post-George Romero zombie flicks to successfully jettison the long-stale formula of shuffling corpses attacking dumb suburbanites in farmhouses. Instead, the film re-imagined the concept for a post-9/11 world flush with fears of terrorism, military imperialism and medical technology run amok. It was a bloody, violent, scary little sleeper, and finally zombie fans had reason to celebrate. Rare for a genre film, '28 Days Later' was also well-received both critically and commercially, and the film -- shot for a paltry $8 million -- went on to gross nearly $85 million worldwide. Although '28 Days Later' worked just fine as a self-contained, one-shot deal, given its tidy gross, a sequel was probably inevitable. But how do you continue a story that saw just about the entire world overrun by infected zombies? It says a great deal about '28 Weeks Later' that it manages to both extend the original's storyline in a fairly believable, coherent way, but also expand the depth and scope of its themes. It's a delicate tight-wire act for any sequel to attempt, and even if '28 Weeks Later' is not a superior film to '28 Days Later,' it's certainly one of the better follow-ups in recent memory. As the sequel's plot takes quite a few twists and turns, I won't spoil much of it with plot recap. Simply put, 'Weeks' jettisons all of the characters from 'Days,' and creates a plausible scenario for where the world might have gone following the events of the first film. It is now 28 weeks beyond the events of 'Days,' and most of the major cities have been quarantined, turned into virtual walled fortresses meant to keep the uninfected people in, and the drooling zombies out. We are introduced to a few surviving members of a local English family (including 'World is Not Enough' Bond villain Robert Carlyle), who have been relocated to London. But when the clan's presumably deceased mother returns, seemingly immune to the zombie virus, some unpleasant family dynamics erupt, and soon all hell will once again break loose. Needless to say, this turf will not be unfamiliar to any zombie movie fan. George Romero has made a career out of it, and 'Weeks' certainly owes more than a passing nod to the city-under-siege scenario of Romero's recent 'Land of the Dead.' Likewise, in painting its human heroes (and the military forces meant to protect them) in shades of gray, '28 Weeks Later' also shares another key trait with the best films in zombie genre in that its underlying tension is often derived from the question of who's the bigger monster -- the zombies, or us? '28 Weeks Later' makes many allusions to the current Iraq war (most oblique, a few heavy-handed), and stages such horrifying setpieces that at times it's as effective as any of the greatest war films. The second act turning-point, the infamous "lockdown" sequence, is particularly impressive, both as a expertly-staged example of cinematic horror and as a brutal critique of the what has, historically, been the ineptitude of a military response to genocide. When '28 Weeks Later' is able to successfully merge its more high-minded thematic ambitions with its technique, it's downright invigorating. Unfortunately, the film falters as it nears its conclusion. After setting up such a potent vision of the future, and a genuinely intriguing family of three-dimensional characters, the conventions of the genre would seem to demand that intelligence take a back seat to visceral shock. As such, the last 20 minutes are all action, as we stumble to the film's cliched gory conclusion. Still, '28 Weeks Later' offers enough ambitious ideas and truly scary moments that it's well worth seeing. Even if you didn't love '28 Days Later' (or haven't even seen it), this sequel is one of the few that legitimately works as a stand-alone film. I wish it had served up a more satisfying climax, but '28 Weeks Later' remains one of the better recent entries in the genre. 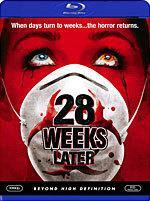 Fox presents '28 Weeks Later' in 1080p/AVC MPEG-4 video in the film's original 1.85:1 theatrical aspect ratio. The film was shot on a variety of stocks, including Super 16, Super 35, and HD video. As such, it's not really the kind of material tailor-made for high-def. To be sure, this Blu-ray is up to the challenge, but don't expect a new demo disc. Although the majority of the film was shot on Super 16 (thanks to Matt for sending along this article about the film's cinematography), to my eye, the source still looks somewhat "video-esque." The source pristine, but blacks are rarely rock solid. The image often looks flat with contrast that appears flattened out in the mid-range. Rarely if ever does the presentation "pop," and depth is decidedly two-dimensional. Detail is still pretty good all things considered, though black crush can be severe with fine textures usually lost in the blackness. Stylistically, it works for the film, but colors are generally desaturated, with hues never looking very vivid (except for a key use of deep red lighting during the "lockdown" sequence, which is quite effective). There does seem to be a blue-ish cast to the picture at times, although fleshtones are pleasingly accurate. Depending on the source material, grain and noise can also be fairly common issues -- shots frequently look fuzzy and indistinct. Again, aesthetically, it suits the material, but in all honesty there are sequences in '28 Weeks Later' where I forgot I was watching a Blu-ray and not just a very good-looking standard-def DVD. Fox has delivered another DTS-HD Lossless Master Audio 5.1 Surround track (48kHz/24-bit) for '28 Weeks Later,' from which I was only able to extract the core 1.5mbps DTS track. Alas, I was not entirely blown away by the film's sound design. I didn't expect it to be so restrained, and it certainly could have used more aggressive atmosphere. Discrete rear effects and sustained ambiance are lackluster. The mix is quite front heavy, which is a shame, because the electronic score by John Murphy is creatively integrated with the eerie, almost atonal sound effects, and had it all been spread about the soundfield more forcefully, this really could have been a whopper. Instead, the only impact the mix really has is in its loudness. It's almost like the horror film equivalent of a Marilyn Manson song, with high-end harsh enough to be ear-piercing at loud volumes, while the sense of dynamics is quite overbearing, going from loud to soft and back again like a hammer. On the bright side, dialogue holds tight throughout, and I didn't have to adjust volume to compensate. Low bass can also deliver some intense low frequencies to the subwoofer. I personally could have used a little less bombast and more subtle ambiance, but to be sure, '28 Weeks Later' still delivers its fair of sonic jolts. '28 Weeks Later' hits Blu-ray day-and-date with the standard-def DVD release, and both discs carry identical supplemental packages. The Blu-ray does get a nice boost, though, as Fox has upgraded the quality of most of the material (except where noted below) to full 1080i/MPEG-2 video. First up are a trio of making-of featurettes. "Code Red: The Making of '28 Weeks Later'" is your basic EPK, but it's better than most. Director Juan Carlos Fresnadillo and producer Enrique Lopez Lavigne are the primary talking heads, joined by most of the main cast via on-set interviews. Though there is the usual plot recap, we do get some valuable insight on the challenges in creating a fresh sequel to a film like '28 Days.' There's also an ample amount of very cool fly-on-the-wall production footage. The other two featurettes are more specific. "The Infected" takes a closer look at the men and women who earn their scale wages by running around as zombies, covered in blood and wailing like banshees. "Getting Into The Action" covers some of the film's grisliest effects, as well as the stunt mayhem. Fresnadillo and Lavigne also contribute a full-length audio commentary, which delves a bit deeper than the featurettes, but remains somewhat spotty. Both are clearly intelligent and well-spoken, but their tone is arid and the track is marred by awkward pauses. Still, the pair touch upon all the main topics, with Fresnadillo articulating the deeper themes of the story (the guy doesn't have a particularly optimistic view of the military, that's for sure) and his approach to the visuals, while Lavigne offers a producer's perspective on the budgetary challenges and staging the key action scenes effectively. Next up are two Deleted Scenes, both presented in 480i/MPEG-2 only. The first is a dialogue scene between the Robert Carlyle character and his son that doesn't offer much; the second is a disappointing alternate ending (the theatrical conclusion is, if not entirely satisfying, at least much better). Fresnadillo and Lavigne again provide optional commentary. Tying into the Fox Atomic line of graphic novels based on the '28 Days Later' franchise, there are two animated short films, also presented in 480i/MPEG-2. "28 Days Later: The Aftermath: Stage 1 'Development'" (8 minutes) and "Stage 3 'Decimation'" (7 minutes) are nicely rendered montages of slick artwork, accompanied by sound effects, music and dialogue (note that none of the talent from the theatrical films appear). Since I haven't followed the graphic novels myself, I had some difficulty following the storylines (especially "Development," which is quite confusing), but I'm sure fans will get a kick out of this. '28 Weeks Later' is an above-average sequel that expands upon the mythology established in '28 Days Later.' It's exciting, scary and suspenseful, and has a nice socio-political commentary simmering just beneath the surface; just what you want from a modern-day zombie movie. This Blu-ray release is no slouch, either. Although the film's source materials don't exactly scream "demo material," the video and audio are solid, and we get a nice supplements package as well. All in all, this one's an easy recommend for fans of the franchise, and is well worth a look for casual horror fans.